I was never a fan of cranberry sauce, but I had only been exposed to the canned goop. I always thought I didn’t like cranberries, but I do like craisins, so I must like them on some level, right? Last year I “needed” to make fresh cranberry sauce. Why? Who knows! Maybe it’s because they look so pretty and festive in the produce aisle. Anyway, much to my surprise, the fresh cranberry sauce was incredibly simple to make, and really quite good! 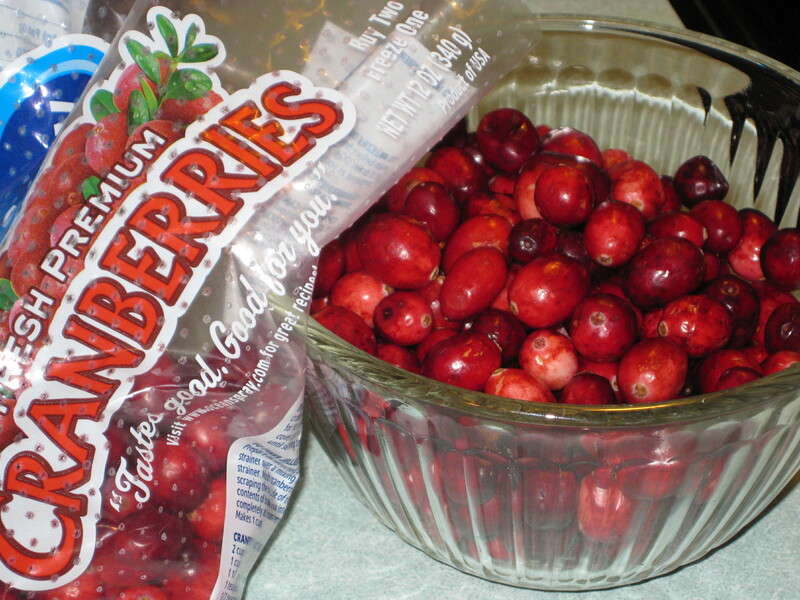 This year I bought 2 bags of fresh cranberries and tossed them in the frig waiting for inspiration to hit. I finally decided on cranberry sauce again, to be used for sauce and for a dip. If we had eaten turkey for Thanksgiving, this would have been our cranberry sauce. We had Honey Peach Pecan Pork Roast instead, so no extra sauce was needed. But I wanted cranberries anyway, and since I was the chef du jour, we were having cranberries! I put my son-in-law to work stirring the sauce (click for the recipe), and told him to try a bite of candied ginger. If you haven’t tasted it, candied ginger is quite strong, with a heat that creeps up on you. He wasn’t so sure he liked it (but I enjoyed his reaction!) so I trimmed down the amount I put in the sauce. Now that the family has been “baptized” with candied ginger, I’ll add more next time! Between the cranberries and the blueberries, the result was a beautiful, dark berry mixture with orange and ginger accents. 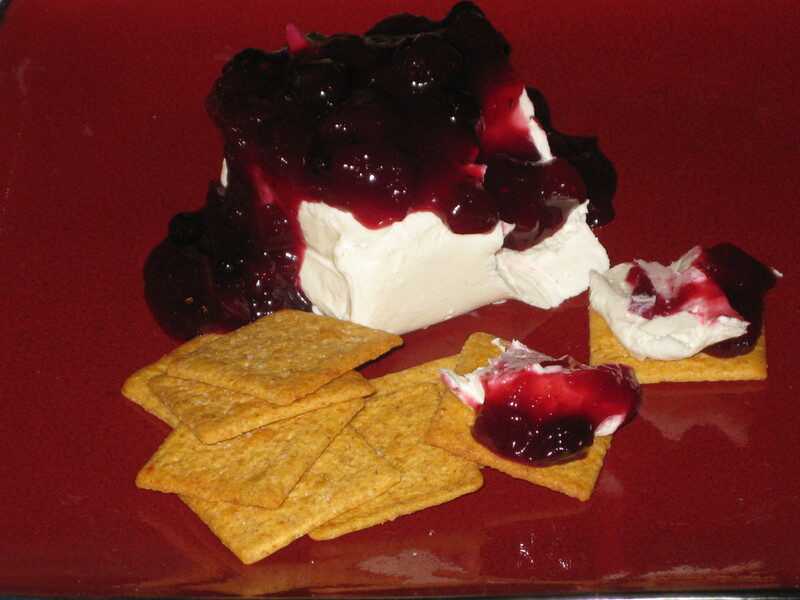 To serve it as an appetizer, I poured it over softened cream cheese, and put out some crackers. This sauce works well as a condiment to turkey, chicken or pork; as a dip with cream cheese and crackers; or as a schmear for bagels or English muffins. Get yourself some of those beautiful berries and let me know how you like it! Try it as a condiment for turkey or pork; as a dip over cream cheese; or as a schmear for bagels or English muffins.